Mission Impossible: Rogue Nation has taken the box office by storm, taking well over $300m worldwide. One of the main reasons for its massive success is undoubtedly Tom Cruise and his willingness to take part in increasingly insane stunts. Cruise, who turned 53 this year, is famous for doing his own stunts and he takes it to the next level in Rogue Nation by clinging to the side of plane during take-off (yes, it’s actually him) and jumping 120 ft into a pool of water before holding his breath underwater for 6 minutes (again, he actually did this). In honour of Tom Cruise and his dedication to nearly killing himself for our entertainment, here are some of the craziest stunts in film history! Before clinging to the side of a plane and holding his breath for an inhuman amount of time, Cruise’s greatest stunt involved scaling the side of the world’s tallest building with just a safety rope for company. He made it to the top too. 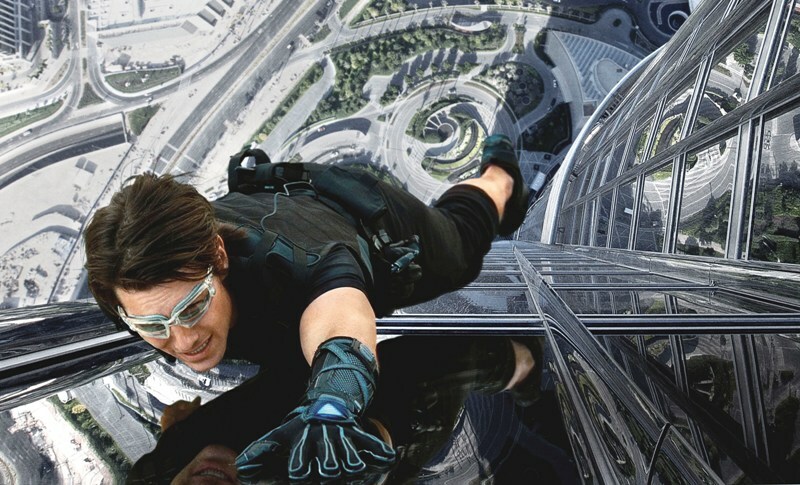 To prepare for the climb, Ghost Protocol’s crew built a small scale replica of Dubai’s Burj Khalifa so Cruise could practice. After 200 hours, he was ready and risked death tackling the real thing. To make matters worse, Cruise also had a custom-made wind machine blowing in his face the whole time. Unsurprisingly, Ghost Protocol’s insurance company were reluctant to cover the world’s biggest movie star possibly falling off the world’s tallest building – so Cruise fired them and found a company that would. How do you follow one of the greatest superhero movies of all time? You come up with a spectacular opening stunt sequence that’s (almost) entirely real, that’s how. While some CGI was involved, most of Bane’s escape from a CIA jet was performed by 4 stuntmen attached to cables. The stuntmen had to shimmy down the cable from another jet to board the CIA jet then cling on for dear life while the CIA jet (replaced by a glider) disintegrated. And you thought you had a hard day at work! The Matrix Reloaded’s highway chase sequence is one of the most ambitious stunt sequences ever conceived. The scene, in which Trinity weaves in and out of traffic on a motorbike while being pursued by agents, was filmed on a prop highway that cost a remarkable $2.5 million to build. The sequence took 3 months to film, during which 300 cars donated by General Motors were destroyed. To top it all off, stunt woman Debbie Evans was almost killed when a stunt driver applied the brakes on his truck at the wrong time. The oldest stunt in this post is possibly the most dangerous. Filmed in a chariot arena built especially for the film, the sequence involved 82 horses and over 8,000 extras, and took countless hours of planning and training to prepare. The sequence cost $4 million in total, which is around $33 million today! Despite all the preparation, the stunt co-ordinator’s son, Joe Cannutt, was almost killed while filming. Filling in for Charlton Heston, Cannutt was thrown from his chariot after landing a jump over a flipped chariot. Amazingly, he walked away with just a couple of cuts. The Bond series is filled with legendary stunts, although none were quite as dangerous as the famous ski chase at the beginning of The Spy Who Loved Me. Standing in for Roger Moore, stuntman Rick Sylvester is chased by a group of bad guys on skis before jumping off the side of a 3,000 ft mountain and deploying an ultra-cool Union Jack parachute. It’s an iconic moment but it almost didn’t happen. Despite having numerous cameras on Sylvester, only one of them managed to catch the leap from start to finish. Sylvester was paid a cool $30,000 for his efforts, plus a ‘survival’ bonus. Christopher Nolan’s dedication to real stunts is no more evident than in Inception, when the director co-ordinated perhaps his craziest stunt sequence to date. The spinning hallway fight is possibly the most iconic moment of Inception, and it took a lot of work to put together. The crew constructed 2 dedicated revolving hallways in a hanger. Each hallway was separated into sections which were spun by computer-controlled motors. Of course, the real challenge was filming the sequence. Over 500 crew members were involved, following precise instructions to get just the right shots. It was poor Joseph Gordon-Levitt who had the hardest job, though. Hardly known for scrapping in his films, JGL had to learn the fight sequence while spinning in a circle and it took two weeks of intense training to prepare. According to Levitt, one wrong move could have led to a 25 foot drop! Marvel movies are renowned for their liberal use of CGI, but this incredible scene is pretty much all real. The well-dress folks ejected from Air Force One as it explodes are actually a Red Bull stunt team dressed in business suits, with parachutes hidden under the suits. Apparently, the team completed over 600 jumps during filming! Sylvester Stallone’s 1993 action-thriller is full of amazing stunts, but none quite as amazing as when British stuntman Simon Crane transfers between two jets at 15,000 ft. Everything you see in the scene is 100% genuine and posed a genuine risk to Crane’s life. The planes’ had to travel at exactly 150 mph during the scene, as going any faster would have created wind forces powerful to tear Crane apart. Coupled with extreme cold, a lack of oxygen and the fact he was stepping between two planes at 15,000 ft while suspended by a single rope, Crane’s odds of survival were incredibly slim. Of course, this meant that the filmmakers struggled to get insurance for Crane. It’s reported that Stallone offered to take a pay cut to help pay for the stunt, as he was so desperate to include it in the film. Luckily, Crane survived and walked away with a cool $1 million for his troubles. The stunt remains one of the most expensive in film history. How much is your movie collection worth? Find out now by getting an instant price and selling DVDs with musicMagpie! Just click below to get started.